Chris Till shot this cell phone picture about 11:00 Saturday morning. 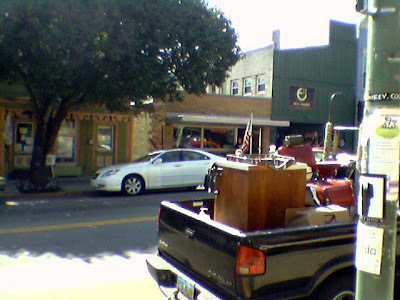 Longtime Yellow Springs barber Greg Hasser's barber chair and barber sink are loaded in the back of his brother's pickup truck, ready to roll into retirement. In the background, Hasser's barber shop neon sign still glows. Greg has been the local barber for over 40 years. Among his many civic contributions are marshalling the Yellow Springs July 4th, 1976 Bicentennial parade, which he led dressed as George Washington in a float/boat crossing the Delaware River. The barber shop is also famed as the location of the 1964 barbershop riots against barber Lou Gegner. Among the many arrested in the riots were former resident Robert Anton Wilson, who became a celebrated author in the 1970s. An Institution is gone; Greg, your shop and you will be missed. Take Care! He did try to find a new barber to take over. With the proliferation of haircut chain stores operating under cosmetology licenses, licensed barbers are getting harder to find. There was never a riot at the Gegner barbershop. Organized demonstrations, yes. Sit-ins, yes. Never a riot.